Peanut, Tiger-Nut, Sweetcorn, Hemp-Seed, Peach, Pineapple and Fish flavoured Oils. 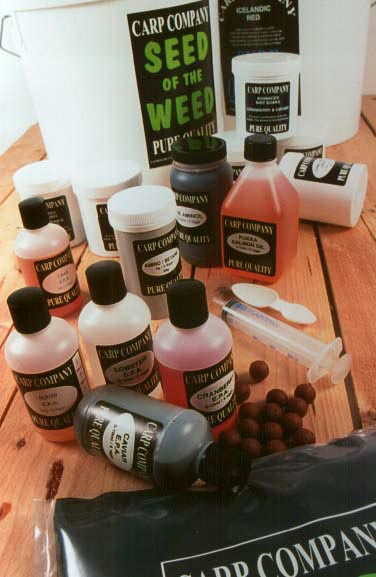 Can also be used as a bait dip/soak or add them to groundbait, pellet, particle, spod, stick and base mixes. Cold pressed and unrefined with a very strong Peanut smell. Use as a bait dip/soak or add to groundbait, pellet, particle, spod, stick and base mixes. A superb blend of roasted and unrefined Tiger Nut Oils with a very strong Tigernut smell. Cold pressed & unrefined with a strong buttered Sweetcorn smell and taste. Use as a bait soak or add to groundbait, pellet, particle, spod, stick and base mixes. One of the best tasting and smelling products that we have seen in years. Ideal for an additive in your base mix but it is also excellent in any groundbait mix or as an additive to particles. It is golden in colour and has a strong buttered sweetcorn smell and taste. Used in particle mixes, Aniseed Oil has a powerful aroma, which has been used for many years in the hunting, fishing and shooting industries to attract and hold animals in a certain area by their recognition of it. 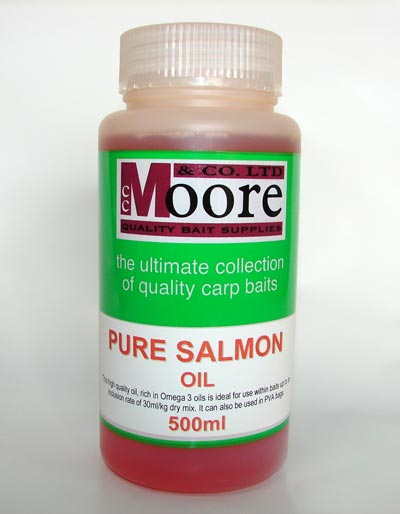 As well as being a recognised supplier of Omega 3 and 6 oils, Salmon oil is also a concentrated source of energy with powerful antioxidant and natural attraction properties that improves the appeal of baits as well as being of significant nutritional value to fish. Being oil, it won't melt P.V.A materials and is ideal for use within stick mixes and P.V.A. bags as well as being a great addition to pellet, particle and spod mixes. 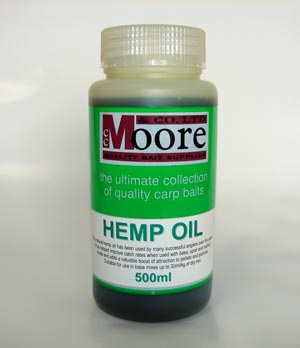 (Marine Halibut Oil) One of the key reasons behind any fish's addiction to halibut pellets is this oil. Used as a powerful attractant as well as a concentrated energy source. 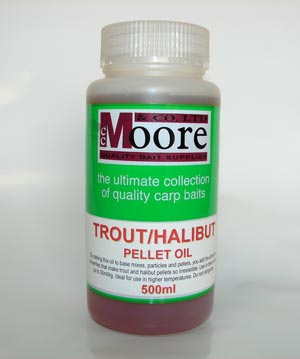 With a very distinctive oily fish aroma and taste, Trout/Halibut Pellet Oil can be used very effectively on or in most baits, but is more suitable for use during the summer months due to its viscous natural state that makes it semi-solidify in cold conditions. A cold pressed essential oil from a citrus type fruit. It has a brisk, honeyed orange-fruit fragrance with a peppery tone to it. A stimulating additive which enhances taste and is great to spice feed up. It blends well with every type of base mix, but stands out with milk proteins, fruity and savoury flavours. A pure organic oil. Cinnamon is known for its property of increasing the activity of enzymes and in this way assists in the metabolic process. Among spices, fenugreek is one of the most well proven carp attractors. Carp loves its spicy, curry fragrance. Fenugreek is high in alkaloids and works thermogenic, in this way promoting the metabolism. A 100% pure natural essential oil. Most garlic essential oils are synthetic oils, which lacks all the specific characteristics of garlic and are not as strong as the natural garlic oil. This superb garlic oil is unbelievable pungent, the strongest we have seen! Only use in well ventilated room, preferable use outdoors. Cold pressed from the rind of mature grapefruit. It assists the digestion and metabolism. Grapefruit oil is high in anti-oxidants and vitamine C. Works very well in combination with all kind of fish-, squid-, shrimp meals etc. Ylang Ylang is a pure organic oil, steam distilled from the fresh picked flowers. High in terpenes. It mixes very well with other essential oils, like: cinnamon, clove, bergamot, eucalyptus, grapefruit, lemon and others. A superb blend of unrefined kernel oils from various Peach varieties. Use in PVA bags, groundbait, stick, pellet and particle mixes or in base mixes at 20-30ml per kilo dry weight. Use in base mixes up to 30ml per kg.